During our careers, we have developed new and innovative concepts pertaining to the pathophysiology of osteoarthritis which have assisted in the development of new therapeutic approaches. Moreover, our laboratory has long sought to develop protective agents for osteoarthritic structural joint tissues. The most significant concepts that have originated from our lab are briefly outlined in this commentary. The Novartis-ILAR Rheumatology Prize was awarded at the 20th ILAR Congress of Rheumatology in Edmonton, Canada in August 2001. The Editors-in-Chief would like to inform readers that this Commentary has not undergone peer-review, because it is based upon the acceptance speech for the Prize. In our work on osteoarthritis, we identified several enzymatic pathways that are intimately related to the development of this disease. More specifically, we demonstrated that, although the matrix metalloprotease (MMP) family is of pivotal importance in the degradation of osteoarthritic cartilage [1,2,3,4,5,6,7,8,9,10,11,12,13,14,15,16,17,18,19,20,21,22,23,24,25,26] (Fig. 1), the serine- and cysteine-dependent proteases [27,28,29,30] also play a significant role. We were among the first to introduce and demonstrate the importance of an imbalance in enzymes and their specific inhibitors (tissue inhibitor of MMP, cathepsin B-inhibitors and plasminogen activator/plasmin/plasminogen activator inhibitor-1) in osteoarthritic tissues. This concept is now well recognized as an intimate element in the pathogenesis of osteoarthritis. Pathways involved in the osteoarthritis disease process. The evolution of the osteoarthritis disease process is characterized by cartilage degradation caused, at least in part, by proteolytic breakdown of macromolecules, in which matrix metalloproteases (MMPs) play an important role. Further fibrillation and erosion of the cartilage surface result in the release of molecular breakdown products into the synovial fluid. The phagocytosis of cartilage matrix breakdown products and other materials by synovial macrophages induces an inflammatory reaction in the synovial membrane, thereby resulting in local synthesis of proteases and proinflammatory cytokines. The proteases and cytokines released by the synovium diffuse through the synovial fluid and into the cartilage. They induce additional cartilage breakdown by direct macromolecule proteolysis and by stimulation of chondrocyte cytokine production to increase the synthesis of proteases. There is also an increased level of cytokine receptors on the cell. ICE = interleukin-1β-converting enzyme; IL = interleukin; MT-MMP = membrane-type matrix metalloprotease; TIMP = tissue inhibitor of matrix metalloprotease; u-PA = urokinase plasminogen activator; - refers to inhibition; + to stimulation. A part of this figure was adapted from figure 110.1, stage III in , a figure produced by Amersham Pharmacia Biotech and reproduced with permission from . In recent years, we have been involved in the discovery of a new collagenase, collagenase-3 (MMP-13), in cartilage and demonstrated its involvement in the osteoarthritis disease process . We were also the first group to clone human collagenase-3 promoter, more specifically its 5' flanking region (GenBank #U52692) . From the work undertaken in our laboratory, we have come to the hypothesis that collagenase-3, in contrast to collagenase-1 (MMP-1), is involved in the remodeling phase of osteoarthritic cartilage [21,22,23,24,26]. Moreover, we also found that, although many cytokines and factors can upregulate collagenase-3, transforming growth factor (TGF)-β appears to be the factor responsible for its upregulation in vivo in osteoarthritic cartilage [21,24,26]. Altogether, these findings have proven to be of utmost importance, as some pharmaceutical companies have targeted MMP and tissue inhibitor of MMP as effective ways to prevent osteoarthritis progression. Moreover, it appears that a specific blockage of collagenase-3 is the preferred candidate in osteoarthritic patients. Since there is a dysregulation between matrix synthesis and degradation in cartilage affected by osteoarthritis, researchers have been seeking factors that favor the formation of a durable functional articular surface following damage. Because of its properties, we studied the involvement of insulin-like growth factor-1 (IGF-1) in cartilage and bone [31,32,33,34,35,36,37,38,39]. Our studies revealed the identification of a metabolic disorder associated with the development of osteoarthritis. We showed that, although more IGF-1 is secreted by osteoarthritic chondrocytes, these cells are hyporesponsive to this growth factor. This phenomenon was not related to a change in IGF-1-receptor expression but rather to an increase in IGF-1 binding proteins that affects the bioavailability of IGF-1. Further studies showed that prostaglandin E2 (PGE2) upregulated the levels of IGF-1-binding proteins. We also investigated TGF-β in osteoarthritic cartilage and most specifically its effect on collagenase-3 upregulation. Interestingly our data revealed that TGF-β acts in a differential manner in regulating collagenase-1 (MMP-1) and collagenase-3 (MMP-13). Indeed TGF-β1 and -β2 have an identical pattern in the upregulation of collagenase-3 (MMP-13), which depends on the metabolic state of the chondrocytes . In contrast, TGF-β1 upregulates collagenase-1 (MMP-1) and this was not dependent on the metabolic state of the cells. TGF-β2 has no effect on this enzyme. In addition, we recently provided evidence that, in human osteoarthritic cartilage, extracellular activation of TGF-β appears to be controlled by the furin convertase . As a result of the work on the enzymes, and more specifically on MMPs, it became clear that the enzymatic alterations could explain the exhaustive degradation of the articular joint tissue. However, this did not provide an explanation for the increased synthesis and expression of these enzymes and the decreased production of their inhibitors. 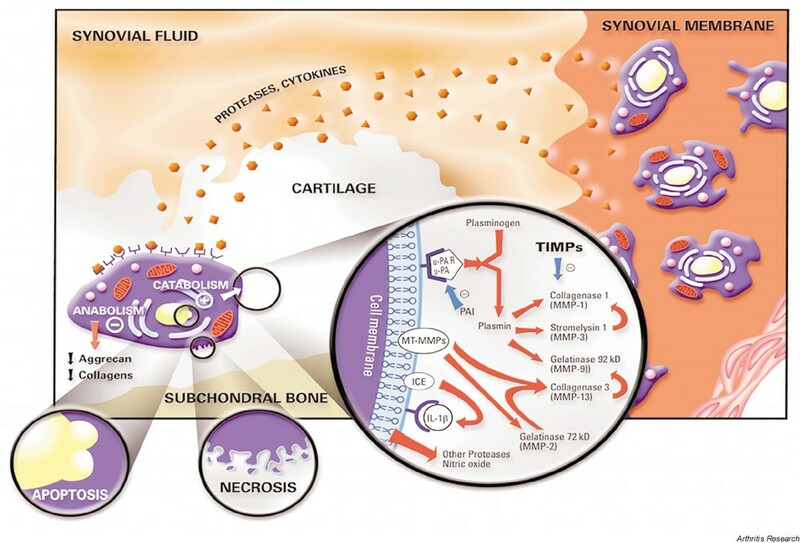 Another hypothesis that was brought forth, and was a turning point in the understanding of the pathophysiology of osteoarthritis, is the involvement of synovial membrane inflammation. This hypothesis was based on the demonstration of the prime role of the proinflammatory cytokine interleukin (IL)-1β in this disease [40,41,42,43,44,45,46,47,48]. In addition to demonstrating that IL-1β is responsible, at least in part, for the changes seen in osteoarthritic joint tissues [41,42,45,48,49], we documented the mechanisms by which IL-1β stimulates osteoarthritic cell-biological activity and how this process was modulated. This led to the study of IL-1 receptors (IL-1Rs) as well as to the study of its natural antagonist, IL-1Ra [44,50,51,52,53,54,55,56]. In brief, data showed that IL-1β was the major autocrine proinflammatory cytokine involved in the stimulation of catabolic factors, including MMPs. The data also revealed that the type I IL-1R was responsible for mediating the IL-1 activity, the number of this receptor type significantly increased in osteoarthritic cells [44,50,53]. These findings introduced the hypothesis that specifically blocking the activity of IL-1β would protect against structural changes in osteoarthritis. A relative deficit of IL-1Ra vis-à-vis IL-1β was also found in the diseased tissue, and it was shown that the use of IL-1Ra could reduce IL-1β-induced cartilage degradation [54,55,56]. In fact, we demonstrated in vivo (by intra-articular injections of recombinant IL-1Ra in an experimental OA animal model) that the elevated IL-1Ra level in joint tissues reduces the progression of this disease. Since the administration of proteins is a major weakness for drug delivery, we pursued our research by using gene therapy as a novel therapeutic approach. In vivo studies using two experimental animal models and two different strategies were conducted. The first employed an indirect, or ex vivo, approach in which the IL-1Ra gene was transferred in vitro into the synoviocytes with the use of an adenovirus vector, and the transfected cells reintroduced into the joint. The second used a direct, in vivo, gene transfer utilizing a liposome complexed with a DNA plasmid encoding the IL-1Ra gene. Collectively, data demonstrated that the IL-1Ra gene can be transfected into osteoarthritic cells and produce an IL-1Ra protein that results in a significant reduction in the progression of the disease. We are currently increasing our knowledge of gene therapy for its eventual use in human osteoarthritis. Recently, we also demonstrated that the specific enzyme responsible for the extracellular release of active IL-1β, the IL-1β-converting enzyme (ICE), was present in both human cartilage and synovial membrane, and its level significantly increased in osteoarthritic tissues . We also showed that ICE-specific inhibition in human osteoarthritic cartilage resulted in a complete abrogation of active IL-1β formation. These findings support the notion that blocking this enzyme represents another interesting potential target for osteoarthritis therapy. Recent work in our laboratory strongly points to the fact that the peroxisome proliferator-activated receptor gamma (PPARγ) system may represent a therapeutic target in osteoarthritis [58,59]. Indeed, we showed in human osteoarthritic chondrocytes and synovial fibroblasts that PPARγ ligands inhibit IL-1β-induced production of MMPs and nitric oxide (NO); this occurred at the transcriptional level. 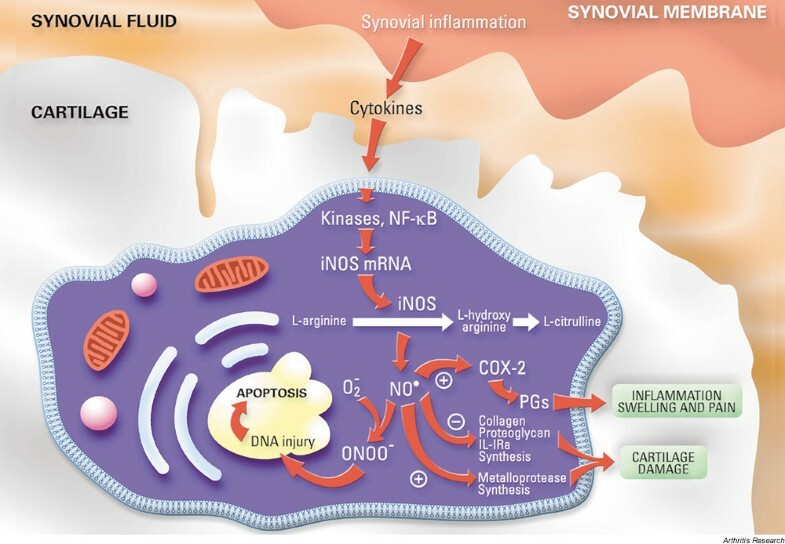 Our work also ascertained that another factor, the inducible form of nitric oxide synthase (iNOS), is an extremely important element in regard to the pathophysiology of osteoarthritis [60,61,62,63,64,65] (Fig. 2). We showed that there is excess production of NO in osteoarthritic cartilage that is generated via an increase in the iNOS level. NO also appears to be responsible for inducing many of the catabolic pathways responsible for osteoarthritic cartilage degradation, such as the reduction of IL-1Ra. Very importantly, we recently demonstrated in vivo the potential for the selective inhibition of iNOS to reduce the progression of osteoarthritis in an animal model [61,62,64]. The in vivo inhibition of iNOS reduced the severity of structural joint-tissue changes, which was associated with a reduction of MMPs in articular cell tissues and chondrocyte apoptosis, as well as a reduction in the levels of IL-1 β and PGE2 in synovial fluid [62,64]. Recently, we demonstrated that exogenous PGE2 may sensitize human osteoarthritic chondrocytes to cell death induced by NO [65,66]. These latter data indicate that a possible molecular target for the inhibition of chondrocyte apoptosis is NO and extracellular factors involved in signaling. Pathways of nitric oxide (NO) formation and effects on articular chondrocytes. COX = cyclooxygenase, IL-1Ra = interleukin-1 receptor antagonist, iNOS = inducible nitric oxide synthase, NF = nuclear factor, PGs = prostaglandins, - refers to inhibition; + to stimulation. Reproduced from figure 110.3 with permission from . Earlier, we addressed the idea that cytokines are an interesting link in osteoarthritis for tissue cross-talk (synovium-cartilage) leading to the development and progression of this disease. As a result of data from morphological and clinical studies investigating the subchondral bone in osteoarthritis, it has been proposed that subchondral bone plays a significant role in the progression of this disease. A question that still remains to be answered is whether the changes in subchondral bone induce or only participate in disease progression. We recently investigated this concept, and our data provided new substantiated evidence that subchondral bone alterations are likely to be related to the onset or progression of osteoarthritis, rather than being merely consequential ([30,39,67,68] and our unpublished observations). We showed that subchondral bone changes are related, at least in part, to an abnormal subchondral bone osteoblast metabolism. Some local factors produced by subchondral bone osteoblasts, such as alkaline phosphatase, osteocalcin, plasminogen activator/plasmin and IGF-1 systems, and, were cytokines such as IL-6, as well as PGE2 and TGF-β shown to be associated with osteoarthritis progression. Following our in vitro and in vivo data on humans [19,69,70,71,72,73,74] and the in vivo data on animal models [5,49,75,76], we further explored in humans the in vivo effects of intra-articular injections of glucocorticoids. Even though glucocorticoid injections have been used successfully for decades to relieve osteoarthritic symptoms and restore function, there is still debate about whether this drug class has a significant effect on disease progression. We conducted a two-year, double-blind, placebo-controlled study on knee osteoarthritis patients, evaluating the effect of steroids on osteoarthritic symptoms, quality of life and disease progression . Data revealed that repeated steroid injections were found effective for the long-term symptomatic treatment of knee osteoarthritis without having any deleterious effects on the anatomical structure of the joint. Using existing methods to evaluate disease progression, we were not able in this study to see changes even in the placebo group. We then addressed the question of sensitive and accurate methods for the assessment of the progression of structural changes in osteoarthritic joints in humans when looking at the effect of a drug. Visualization of articular cartilage is now possible with magnetic resonance imaging but quantification of this tissue volume was lacking. We have developed a novel imaging system assessing cartilage volume/thickness using magnetic resonance imaging of the knee. Preliminary data revealed that statistically significant changes in the volume and thickness of osteoarthritic knee cartilage were detectable at 12 months [78,79], which is a considerable improvement over existing X-ray techniques. This technology should significantly improve the investigation of new drugs and their potential to modify the progression of osteoarthritis. Our research has assisted in the advancement of our knowledge of the mechanisms leading to joint destruction in osteoarthritis. At the same time, we have laid the groundwork for the testing of therapeutic interventions in vivo that may be extended to humans. Moreover, the development of software quantifying the volume and thickness of human cartilage as assessed by magnetic resonance imaging will dramatically change the manner in which knee osteoarthritis clinical trials are conducted. Studies will be performed in a timely fashion, allowing the testing of a larger number of molecules that have the potential to retard or stop the progression of the disease. We first would like to thank ILAR and Novartis, the president of ILAR, Dr Jan Dequeker, and the members of the scientific committee for giving us this award. We also want to thank the supervisors we had during our fellowships, Professor DS Howell, Professor RA Altman, and Professor JF Woessner (all at University of Miami, Miami, Florida, USA), who were sources of great inspiration for us, not only during our fellowships but also afterwards. We also would like to thank the rheumatologists and researchers in our Unit at Notre-Dame Hospital, University of Montreal Research Center for their confidence, valuable assistance, collaboration and enthusiasm over the years; we greatly appreciate their support. Many other collaborators have also assisted in the development of our ideas and research, and we thank them all. Finally, we would like to acknowledge the governmental organizations (Canadian Institutes of Health Research, formerly Medical Research Council of Canada, and the Fonds de la Recherche en Santé du Québec), the Arthritis Society and the companies who believed in our research and provided grants or donations for the continuation of our projects.